The following is adapted from the introduction to the inaugural edition of Messianic Jewish Issues. https://www.perfectword.org/wp-content/uploads/2017/04/logo-full-size.png 0 0 Kevin Geoffrey https://www.perfectword.org/wp-content/uploads/2017/04/logo-full-size.png Kevin Geoffrey2010-08-24 20:37:572017-07-05 15:43:19Kevin's Got "Issues"
Who Is a Jew, and Why Does it Matter? According to present-day halachah, in order for a Jew to make aliyah (emigrate) to the State of Israel, he must have at least one Jewish grandparent. While traditional halachah does not carry any divine authority, in this case, it does agree with the pattern of Scripture. Assuming other factors (i.e. a living heritage passed down generationally), Scripture appears to qualify a person as a Jew who is (genetically speaking) ¼ or 25% Jewish (see graphic, right)—that is, he has at least one fully Jewish (statistically-significant) grand-parent or equivalent lineage. Why is this important? For Jews whose heritage has been obscured from them, it aids in the restoration of their birthright as sons or daughters of Israel. 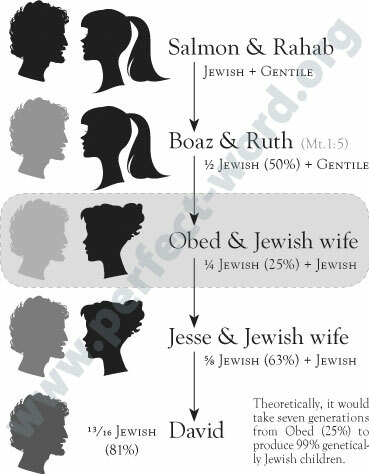 For Gentile believers in Yeshua who may otherwise be tempted to covet Jewishness (see “Am I Really a Gentile?”), it helps to affirm their birthright as the recipients of the blessings of Israel (Genesis 12:1-3), and keeps them strong in their identity as fellow-citizens with Jewish believers in the Household of God (Ephesians 2:19). https://www.perfectword.org/wp-content/uploads/2017/04/logo-full-size.png 0 0 Kevin Geoffrey https://www.perfectword.org/wp-content/uploads/2017/04/logo-full-size.png Kevin Geoffrey2010-08-24 17:14:152017-07-05 16:08:06Who Is a Jew, and Why Does it Matter?